What is „Bioterra Natural 100% – in – Box“? 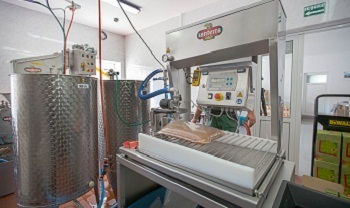 The freshly pressed cloudy apple juice is guaranteed a long shelf life by the pasteurization process. 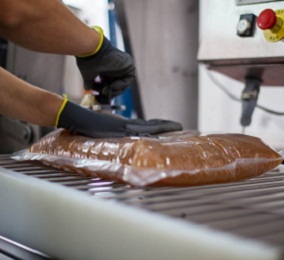 The juice is heated at 78°C (172°F) for 5 seconds, then vacuum-packed in sterile plastic bags. After opening the tap, the juice inside the bag has no contact with the air because as it empties, the bag shrinks under its own weight. 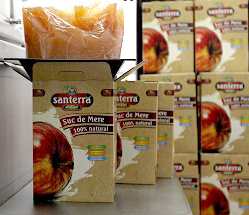 Thus, unlike with conventional packaging, where the juice comes in contact with the air upon opening, thanks to the bag-in-box system the juice is safe from oxidation and doesn’t need added preservatives to maintain its freshness. This is the reason you don’t need to worry about a short expiration date! If classicaly packaged juice should be consumed within 2-3 days since opening, Bioterra Natural 100% – in – Box is just as fresh up to four weeks after opening the tap. And there’s no need for it to be stored in a cold place! Yes, after opening the tap, you have four weeks to enjoy every day the delicious Bioterra Natural 100% cloudy apple juice! However, we hope you won’t need so long to finish up a 3, 5 or 10 liters box of Bioterra Natural 100% cloudy apple juice! Natural, no artificial colorings or preservatives, no added sugar.